Detroit Social Club, the baby of Newcastle songwriter David Burn that has translated to a six-piece live experience, is looming large on the horizon. The band’s raucous debut album ‘Existence’, a blistering set of 10 songs, will be released at the end of the month. Biffy Clyro, I’d watch your backs if I were you. The album begins with ‘Kiss the Sun’, coming in like a jetliner before frontman Burn’s vocals come swaggering in. Jimi Hendrix may have wanted to ‘kiss the sky’ but he might have had a change of heart, had he heard this tune. ‘Black and White’ was one of the first songs from this band made available, and it steadily builds and builds into a wailing number. String instrumentation is sometimes perceived as a wrong turn in rock albums but not in DSC’s ‘Northern Man’. I actually think it shows a slightly softer side to this band, with Burn’s voice suggesting a bit of Scott Weiland (Stone Temple Pilots). In other tracks like ‘Chemistry’ and ‘Silver’, Burns channels the late Kurt Cobain and does a good job of it. The latter features appealing, unearthly squealing guitars. I was confused by ‘Rivers and Rainbows’, sounding like an successful attempt at crossing rap/rock not heard since the days of Limp Bizkit. Similarly, ‘Lights of Life’ seems like a misstep, as if the band tried to take a Coldplay song (complete with whiny, echoing vocals) and retool it into ‘real’ rock. Not happening. I appreciate the effort to try to change things up and make this sound unlike any other indie rock albums, but DSC should stick to what they know: the compelling, lyric-driven rock song. Example: check out their forthcoming single ‘Prophecy’. Mark my words, this is going to be one of the songs of this year’s summer festival season, with melodious guitar and a sweeping chorus. ‘Sunshine People’ and its infectious background vocals of “ba-ba-ba-ba” is even better, with festival crowds for sure to be joining in as Burn’s sultry vocals “wash over”, drums pound, and Jimmy Page-esque swirling guitars lead the way. This track is the most radio-friendly on the whole album. Kasabian, anyone? It’s down, dirty and brilliant. Which is fine. This album is dark, dark, dark rock, as should be an album with a name like ‘Existence’. And while it doesn’t have the same guitar power as, say, a Metallica album, it’s more than enough to get most hard rock heads excited that there is some attitude coming out of the Northeast. To be honest, I wish Foo Fighters, Pearl Jam and whatever grunge bands trying to recapture their long-gone magic would stop already, because bands like this prove that there are blokes out there today ready to make their mark – and in a better way – than they did in a previous lifetime. Detroit Social Club, get ready for your close-up. 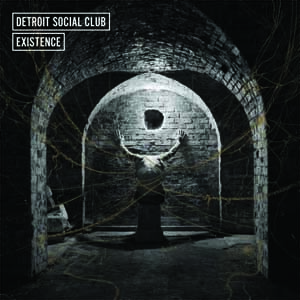 ‘Existence’, the debut album from Newcastle band Detroit Social Club, will be released on 31 May 2010 by Fiction Records. ‘Prophecy’, the lead single from the album, will be released on 24 May. You can pre-order a signed copy of the 7″ single here. We are currently running a competition for tickets for their Leeds, Bristol, and Birmingham appearances on the New to Q tour – details here, competition ends 8 PM Wednesday 12 May.